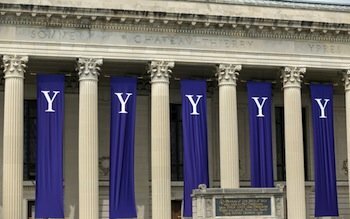 Yale University. Photo by Shutterstock. Sofia Petros-Gouin, a Columbia University freshman, visited friends at Yale University over the weekend. She attended a Halloween party at the Sigma Alpha Epsilon (SAE) fraternity house on Friday and saw a white SAE member standing at the crowded entrance, telling a group of Black and Latino women they couldn’t come in. “He held his hand up to their faces and said, ‘No, we’re only looking for white girls,'” Petros-Gouin said. I’d just like to take a moment to give a shoutout to the member ofYale’s SAE chapter who turned away a group of girls from their party last night, explaining that admittance was on a “White Girls Only” basis; and a belated shoutout to the SAE member who turned me and my friends away for the same reason last year. God Bless the USA. Reminds me of the time they asked me and a group of other Latino, predominantly Mexican, friends for our passports when we tried to go to their shi–y party a little over a year ago… So sorry this sh-t is still happening! Can’t stand those rich, spoiled and rude brats. An SAE member spoke anonymously to the Washington Post. He said members of the house let everyone in until a party gets crowded, and they always ask for Yale IDs.He added that no one with a Yale ID was turned away before 11:15 p.m., and after a noise complaint from Yale and New Haven police, they stopped letting people in. He said the SAE member working the door at the time was Black and that a Black woman denied entry yelled at him and accused him of barring her because of her race. However, Petros-Gouin told the Post a white SAE member denied the Black and Latino women entrance between 10:30 and 11 p.m.
“He pulled a blonde girl up from the bottom of the stairs oversome people pushed her inside and said, ‘Weare looking for white girls only,white girls only,'” she recalled. SAE, founded in 1856, has previously been accused of having racist traditions. In March, a video went viral of members of the chapter at the University of Oklahoma taking part in a racist chant, using a slur for Black people and referencing lynching. Two SAE students identified as leaders in the racist chanting video were expelled. Following the incident, the national chapter announced initiatives to deter racist behavior. Other predominantly white colleges around the country, including SUNY Plattsburgh (71 percent) and the University of Louisville (77 percent), have also recently made headlines for racial discrimination on campus.